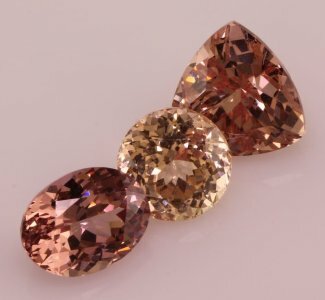 The unique pinkish orange to orangey pink color of lotus garnet makes it an exceptional substitute to Padparascha Sapphire, Morganite and Imperial Topaz. Lotus garnet is a member of three garnet families, pyrope, spessartine and almandine and is usually found in conjunction with rhodolite garnet and spinel. Lotus Garnets are best viewed in sunlight and have a slight red fluorescence which can give the appearance of color change. They have a refractive index between 1.74 and 1.749 (compared to about 1.56 for Morganite it is often compared to) which provides better light return making them sparkle. Lotus Garnet are entirely natural and untreated making them a gem collector's favorite. Their hardness ranging from 7 to 7.5 make Lotus Garnet ideal for any type of jewelry. Find more information on another fascinating african gemstone on our blog at https://www.parlegems.com/blog/?s=lotus+garnet.